Grip trucks are a well-stocked wonderland of just about every large tool and small gadgets you need to tackle a variety of on-set tasks and technical needs. They aren’t prohibitively expensive, even for budget-conscious shoots. When you have your grip truck rental on set, the production magically seems to go faster, smoother and with less stress on the crew. Working grips will tell you that the most important features are the truck layout and the quantity and quality of the carts. They highly value being able to quickly see what they need instead of having to dig for it. Most professional rental houses offer 3, 5, and 10-ton versions of grip truck rentals as well as a 1-ton van package for smaller shoots. What’s inside? 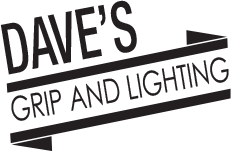 Here’s a walkthrough of a basic 5-ton grip truck package from Dave’s Grip & Lighting. Priceless assets on any set, from preemies to low boys, there’s a stand for every job and you’ll need plenty. In a standard package you get 86 in total, including C-Stands, Beefy Babies, Combos and Low Boy Combos, Hi-Hi Rollers, Mombo Combos, Crank-O-Vators, and Mini Preemie stands. C-Stands, of course, are a filmmaking staple. Grips use them constantly. Stands are true workhorses that you can use any number of applications. Gobo arms and knuckles provide options for hanging lights, draping drop cloths, positioning flags, or gripping and supporting just about anything on set. The 4.5” knuckles known as Lollipops set the standard for on-set safety. You can use them to secure overhead frames or larger flags. Offset arms add that little extra bit of extension and removable turtle bases make getting low-to-the-ground shots super easy. A Platypus clamp is useful for securing bead board. Baby and Junior headers let you mount multiple light fixtures or accessories onto a single stand. Every set needs them and there are unlimited uses and advantages to having them. Full, half, quarter, and eighth (pancake) apple boxes are great for propping, standing, sitting, or leveling. Use them to build a table or nail wall plates to them to hold low-angle lighting fixtures. There’s nothing high-tech about sandbags yet they’re an ever-essential tool. Aside from holding down light stands, you can use them for securing set walls. Convenient handles make it easy to hang them on hooks or risers. Furniture pads, also known as sound blankets, can be used for everything from protecting equipment during transport to blocking light and wrapping large set pieces. Clamps can be one of a grip’s best friends. They come in various sizes and shapes and you can use them in variety of ways. C-clamps are a classic hardware tool, but the ones used on set have spuds welded to the back for mounting them to C-stands. They also utilize u-shaped plates so you can attach the clamp to just about any surface. A Cardellini clamp has two angled jaws that you can tighten onto any round or flat surface. A Mafer clamp (super clamp) is designed to firmly bite down on pipes and poles. They are great for mounting lights in tight or awkward positions. 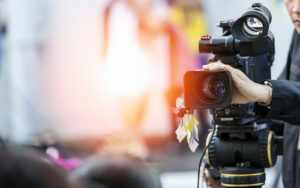 Grip clips are designed for one-handed operation and are perfect for holding reflectors, securing backdrops, and many other jobs where a strong clamp is required. Arri Skypanels, Skypanels, Skypanels. This innovative light seems to be on every grip truck these days. Consuming a modest amount of power and not creating much heat, it is punchy, soft and bicolor. This light does it all! The ARRI Fresnel series, including the 300w, the 650w tweenie, the 1000w T1, and 2000w T2 are ideal anywhere compact and lightweight tungsten Fresnel spotlights are needed. They’re particularly handy in small studio settings where you might have a grid height problem. The ARRILITE 1000w and 2000w focus flood open face are designed to fill large areas. They are also great key lights for interview packages. The ETC Source Four is a 750w fixture with a long throw. It’s generally found on stages, but it also works well in the field. You can manipulate it to cast a range of lighting effects. An Ultrabounce 8×8, 12×12 or 20×20, provides a nice even bounce without any hot spots, while Grifflon features a tough, shiny dual surface with solid black on white side and bright white on the other. Flags and scrims include single net, double net, and poly silk, with a variety of frames supplied. Director’s chairs, different height step ladders, road cones, tarps, pop-up tents, plastic stacking chairs, first aid kit, fire extinguisher, and more. They’re all needed at some point on just about any production (except the fire extinguisher, we hope). You also get common tools like a hammer, staple gun, shovel, rake, broom, and sledge hammer. As well as sawhorses and staples, nails, and screws in your grip truck rental. And no grip truck’s complete without some WD-40 and gaff tape. In addition to a header cart, there are 2 C-stand carts, as well as cable & sandbag and flag & net carts. Black wrap, duvetyne, rubber mats, and clear Visqueen for weather protection of gear or as a floor covering are standard gear, as are foam core, bead board, and a selection of show cards. All grip truck rentals come with or without a driver and we’re happy to help you crew your job with local, proven professionals. Contact us today to learn more or to reserve one of our grip truck rentals for your next South Florida shoot!